The holidays are upon us, and that means it’s time to continue some Dallas-centric holiday traditions and make some new ones. There are some classics you need to visit this season like Santa’s Village, the Christmas trees at the Galleria and Klyde Warren Park. But make time for new things, too, like a holiday tea at the Adolphus hotel or a walk through Enchant at the ballpark. Here's everything you need to do in Dallas over the holidays. The Gaylord is an impressive hotel just in terms of size alone. But they go above and beyond during the holidays to transform the lobby of the hotel into a place full of lights, decorations, and gingerbread houses. Explore the lobby or -- for a cost -- snow tube, ice skate, or watch Rudolph the Red-Nosed Reindeer. Cost: Admission is free to the lobby. If you grow up in Dallas, chances are you went to see the trains exhibit at NorthPark at least once during your childhood. If you didn’t, this is a great time to start a new tradition. Even if you’re not a kid anymore, the 1,600 feet of track is impressive to see. Watch the trains as they move through New England to the Golden Gate Bridge. Cost: Adult tickets are $7. Ebenezer Scrooge comes to Wyly Theatre this season when the Dallas Theater Center performs A Christmas Carol. This is the perfect performance to watch to get into the holiday spirit. The performances start in November and will run through the holiday season, so you’ll have plenty of time to catch a show. Cost: Tickets start from $13. The massive mansions and estates of Highland Park are impressive to look at. Put some holiday lights on them, and then they really glow. A holiday tradition for many North Texas families is to drive through the neighborhood to admire the lights. Take it a step further by going on a carriage ride through the area. Cost: Rides start from $135. Another holiday classic comes to Dallas. This one is a performance of The Nutcracker by the Texas Ballet Theater. You’ll get two chances to watch the show at either the Winspear Opera House or Ball Performance Hall. You’re already humming that Nutcracker song, aren’t you? Cost: Tickets start from $20. During the summer months, Globe Life Park is home of the Texas Rangers. But during the holiday months, the ballpark could be confused for the North Pole. At Enchant, hosted at the ballpark, you’ll explore what’s billed as the world’s largest Christmas light maze along with the largest Christmas tree in North Texas. The photo ops are endless. Cost: Deals start from $19. Every year Vitruvian Park transforms into a winter wonderland of lights. The lights -- along with the giant tree -- make for some perfect photo ops. Take family or save this for a romantic, well-lit stroll. Depending on what night you go, you may run into Santa, food trucks, and music. If you don’t like crowds, go during the week. Cost: Admission is free. Parking is $10 during events. From the preparation to the travel to the extra time with the in-laws, the holidays can get a little stressful. Make some time for some self-care with a tea party. Holiday Tea at the Adolphus is the great opportunity to relax and slow down. From the re-imagined tea room of the hotel, enjoy some tea and treats. Cost: Prices vary. Reservations are recommended. Buddy the Elf comes to Dallas for a limited time this holiday season. If you’ve seen the movie, you’ll love it watching it live. The cast is made up of several Tony Award–winning performers. And remember the rule of the elves: The best way to spread Christmas cheer is singing loud for all to hear. Throughout the year, the field next to Richardson’s City Hall is just a field. But around Christmas time, the field turns into Santa’s Village. Here you’ll find 16 mini holiday dwellings to explore. On the weekends, you can enjoy live performances, holiday photo ops, hot cocoa, and snacks. Dallas doesn’t get a Macy’s Thanksgiving Day Parade, but we do get our own holiday parade. Each year more than 450,000 people come out to watch the parade, which features several local organizations, music, dancers and more. This year you can purchase tickets to get a seat with a good view. Nothing gets you into the holiday spirits like some classic Christmas music. Kick off the holiday season at the Holiday Sing-Along with the Fort Worth Opera. The event will feature a blend of classic carols, holiday songs and some opera favorites. Each year during Chanukah, the Galleria brings out a custom-designed menorah to celebrate the Jewish holiday. As is tradition, another candle is lit each subsequent night at sunset. After the lighting, head over to the bottom floor for some ice skating. Spending some time at Klyde Warren Park is always a great idea, and it’s even nice during the holidays. Take pictures by the giant Christmas tree and take a stroll under the lights. The park will be hosting several events throughout November and December including food trucks, art demonstrations and even a chance to meet Santa. Celebrate the holiday with some music. The Holiday Celebration of Hope and Unity will feature all sorts of music including the world-renowned Sonos Handbell Ensemble, mezzo-soprano Frederica Von Stade, and the Dallas Street Choir made up of those experiences homelessness. Cost: Tickets start from $49. Dress up and enjoy music, raffles, and more to get ready for the holidays. This is more than just a show. It’s a holiday party. Wear your best ugly Christmas sweater or dress up like an elf, bring a new toy and a canned food item for charity and come ready to party. There will also be raffles for gifts so you might go home with something special. Cost: Tickets start from $35. Gaining weight during the holidays is almost inevitable. Between all the parties, the family gatherings and the extra happy hours the pounds add up. 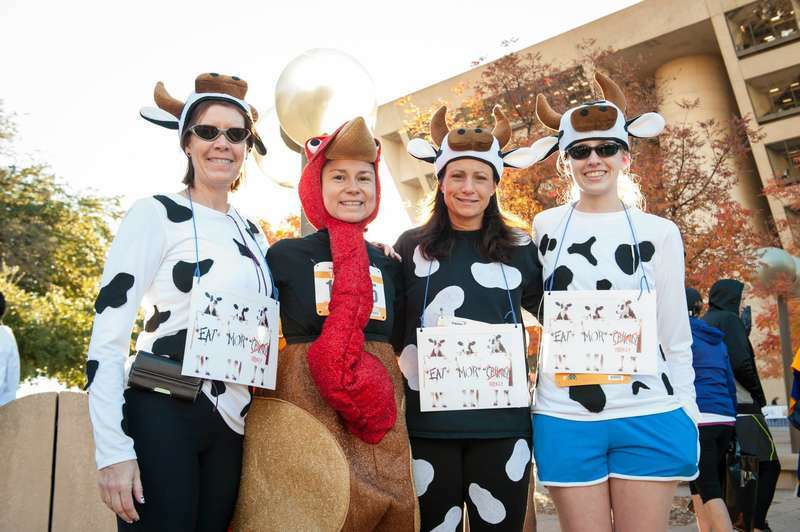 Keep off some of the pounds by training for and running the Dallas Jingle Bell Run. The race is different from others, this is a night run and holiday outfits and costumes are encouraged. Cost: Registration starts from $30. Eat to your heart’s content at what’s billed as “the ultimate holiday bake sale.” The Texas Chefs Association and dozens of tops chefs from local eateries are getting together to make cakes, sweets, pies and cookies. The treats will all be available for purchase and it’s all for a good cause, benefiting the North Texas Food Bank. Enjoy Christmas music played by tubas at TubaChristmas. This year TubaChristmas celebrates 45 years. Head over to Thanks-Giving Square at noon to enjoy the performance including a solo and ensemble repertoire for tuba and euphonium. Panther Island Ice returns this holiday season. It’s Fort Worth’s only outdoor skating rink, decorated into a winter wonderland. After all of the gift opening on Christmas, it’s the perfect activity to get out of the house. Take the family or take your significant other for a romantic Christmas Day outing. More than 4,000 pyrotechnic effects will light the Dallas skyline to ring in the new year from the top of Reunion Tower’s 560-foot “Ball.” There won’t be the Big D NYE this year, but that doesn’t mean Dallas isn’t won’t be doing it big anyway. For a good view, head over to Trinity Groves.